Graphing Social Patterns East 2008 - O'Reilly Conferences, September 06 - November 06, 2008,Washington, D.C.
GSP is the premier conference for developers and marketers building and distributing apps for MySpace, Facebook, OpenSocial and other social networking platforms. 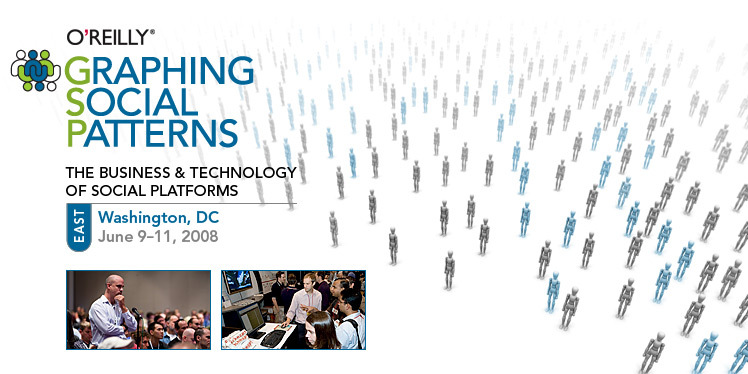 Happening June 9-11, 2008 in the Washington, DC area, this event is for both business executives and technical developers who want to learn more about the evolving environment, and how to reach online communities using new and established social networking platforms and applications. For information on exhibition and sponsorship opportunities at the conference, contact Yvonne Romaine at yromaine@oreilly.com. For media-related inquiries, contact Maureen Jennings maureen@oreilly.com. View a complete list of GSP East contacts.